I've previously blogged on and on about tidepooling in Abalone Cove. Tomorrow, we'll have another low-tide opportunity to putter around the tidepools and visit critters in their rocky homes. Meet at the Abalone Cove State Park parking lot at 1:00 pm for a docent-led hike. Wear sturdy walking shoes that you don't mind getting wet and bring a towel for drying off and a water bottle. 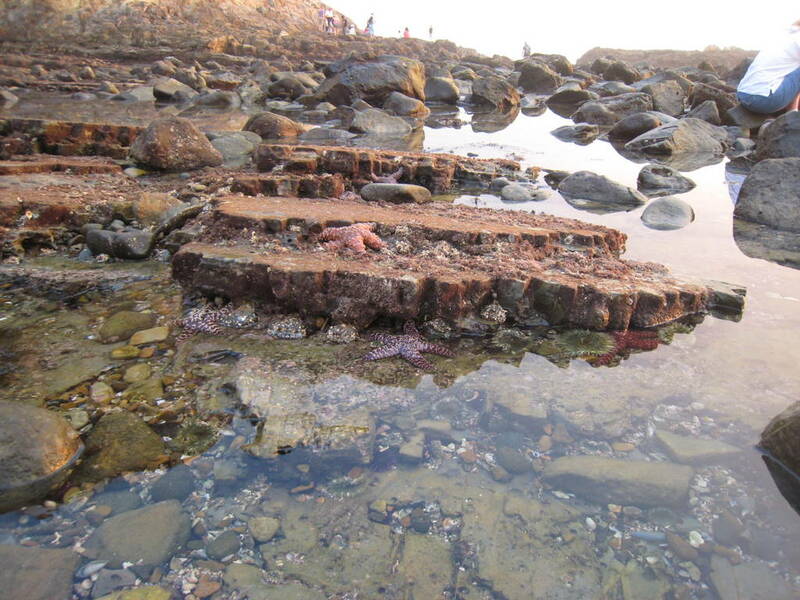 February 24, 2013 (1:00 pm) ~ Join the Los Serenos docents on a public hike to the tide pools at Abalone Cove Shoreline Park (the parking fee will be waived up to 45 minutes prior to the hike and 30 minutes after). View the daily tide predictions for LA. This is a very fun activity for kids and the young at heart. And, tomorrow, the rangers are providing free parking. Did I mention that whales and dolphins frolic offshore from the tidepools? Today, the whale-spotters saw 9 whales and much breaching activity, including synchronized breaching (like synchronized swimming, only on a much larger scale). Message from the observers: One of our northbound pairs there was rolling and the side of the flukes. They milled for a while and their blows were backlit by the setting sun so their blows were pink in color. On two occasions they synchronized their fluke up dives - very pretty. Three of our five sightings were large whales that fluked; this included our southbound whales. FIN whales were seen throughout the day. We counted over eight whales, there were five in just one group. There was one whale that had a "massive blow", but no one used a scope to see if it was a FIN whale or a BLUE whale. Also seen were COMMON, BOTTLENOSE and PACIFIC WHITE-SIDED dolphins. There were a series of three green flashes that each turned blue at the end. We have taken to augmenting the viewing of the green flashes by using our scopes. Pennamite and I are going to the Hive Gallery in downtown LA on Saturday, February 23, to see completely cauchy's work in the Stitch Fetish group show. RealJob prevents CC from seeing the exhibition in person, so we will act as her proxies. Really, who would miss feminist art by someone who names her blog after the Cauchy completeness theorem? Leave a comment with your email address if you are interested in meeting up with us. BTW, in addition to being an artist, stitcher and crafter, Pennamite wrote a PhD dissertation in feminist history; a tour with her will be interesting. 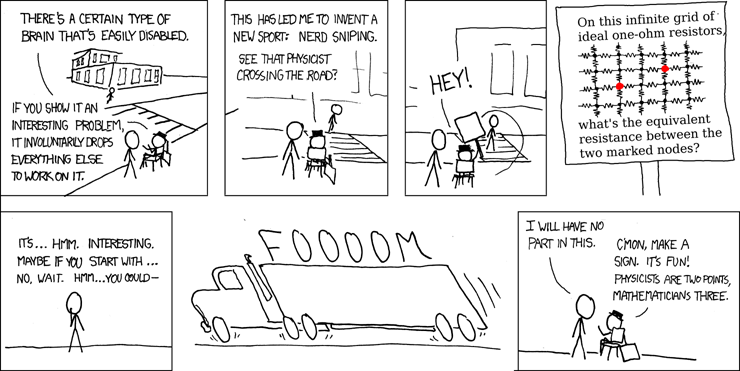 I sent the link to this comic to physics professor, Eric, so he could explain the solution to me. Instead, I sidetracked him from his real work. Oops. 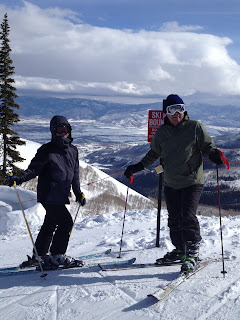 Bad Dad and I took our 12 yo and a borrowed 11 yo to Salt Lake City for some skiing and snowboarding over the long weekend. The snow conditions were poor by Utah's (high) standards, but we managed to ski safely and have fun. I almost nerd sniped myself. The first two days were incredibly sunny and bright and we took advantage of the sun to ski Milly's east-facing slopes each morning. The snow started out crusty and hard and we had to pay close attention to where we could find loose powder to turn. The parts of the trails that faced the sun the longest softened up first. At 10,000 feet, under cloudless skies, the solar irradiance must have been >1000 watts per square meter. 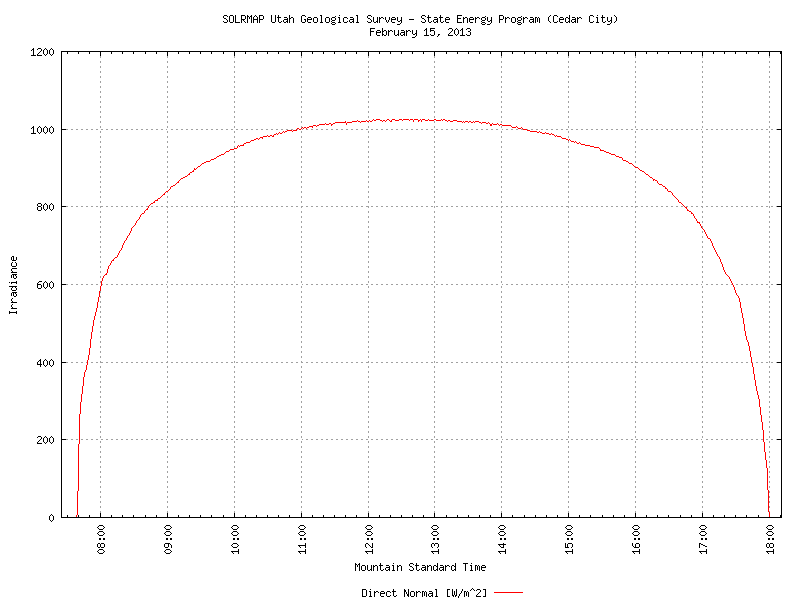 In fact, the solar irradiance plot for Cedar City, elevation 1675 meters (5500 feet), half the elevation of the top of the Milly lift, exceeded 1000 watts on Feb 15. Look at the smoothness of that curve. There was literally not a cloud in the sky. Round to the even number of 1000 watts/m^2, and assume the snow has an albedo of 0.9--it reflects 90% of the incident solar spectrum. Let the snow be in equilibrium with the air temperature of -5 C. How long does the sun have to hit a patch of hardpack (icy snow) for it to soften enough to be skiable (by me)? Recall that 1 watt is 1 Joule/sec. The specific heat of ice at -5 C is 2.027(kJ/kgK). Utah powder has about 13:1 snow:water equivalence. But hardpack would be considerably lower. Let's use 5:1. How warm does the hardpack need to be to give my ski edges something to dig into? Let's just use 0 C as a placeholder until someone who knows better leaves us a comment. I asked a ski instructor who is a retired engineer and then he said that I underestimated the complexity of the problem. He said that it also depended on the wind and sublimation. Grrr! Let's just ignore those for a first pass. I got so wrapped up in this, I almost caught an edge on a patch of ice. Hmmm, the second busiest ski weekend of the year and I needed to concentrate on skiing--not thermodynamics. On the third day, it snowed horizontally. A gust of wind created white-out conditions while we were descending a crowded, steep and narrow section. I knew that I had to keep going forward (albeit slowly) to avoid being hit by a skier above. It's like driving in heavy fog. You can't stop abruptly. You have to control your fear and keep going until you reach a spot where you can stop safely. Iris lost her nerve and spent the rest of the afternoon at the lodge. After the storm, the skiing was beautiful. My camera battery complained about the cold, but our 11 yo guest snapped this picture with her iPhone. On the second day, I left the others to join the "ski with a ranger" tour, where I learned a ton of interesting facts about the natural and human history of Cottonwood canyon. When they realized I was a ringer, the rangers let me give the snow water equivalence and climate change portion of the lecture. On the fourth day, I ran into one of the rangers and she introduced me to a "ranger in training". He took me on a two hour private lesson where he taught me how to ski moguls. My legs are rubber and I am exhausted. But, it was so much fun. And that was even without learning that he met Paul Dirac at Stonybrook, when Dirac came as a guest lecturer for their undergraduate physics class. Many commentators are treating this story, about a Lehigh graduate student who received a 0 out of 25 for class participation and thus earned a C+ in the class, as a joke or a parable about entitlement gone amok. But, I reserve judgement because the same thing happened to me in high school. California high school students are required to take a one-semester class in US government and civics. My HS teacher was so right wing, he made stuff up and proclaimed them as facts. I disagreed with him in class one day when he said that Swedish socialism was so bad, that young women were constantly begging him and his wife to please take them to the US as a nanny so they wouldn't have to live under socialism. When I received a B in that class, when I had earned 100% on all exams and quizzes, I asked the teacher why. He replied that 20% of the class grade was participation and I had earned a 0. I asked how that can be, when I participated. He said that I did not participate correctly and grading is at his discretion. That's how bullies react to evidence that contradict their views. They try to shut down voices that bring up contradictory evidence. When that fails, they abuse their power. In high school, I could use the B as an extra chance to stand out among college applicants. Do you remember the question in the application that asks if there is anything in your academic record that you wish to explain? Anyway, it worked. That low grade helped me get into every college where I applied. I don't know what happened between Thode and Eckhardt. But Thode's story is so similar to mine, that I give her the benefit of the doubt. * My in-laws met and married in Sweden. They immigrated for the weather and for a chance to live in a less homogeneous society. But, they do fondly remember the way Swedes look out for each other. We do NOT live in Texas. I can guess why the previous owner of this shirt had decided to get rid of it. I just wonder why s/he thinks anyone else will want it. I volunteer three days a week as a math tutor at a nearby middle school. For the honor of giving my time away, I am required to be fingerprinted and undergo a routine background check (that took 2 weeks), and pay $56 in administrative fees. Am I crazy for thinking that it should take longer to get a gun than to volunteer at a school? 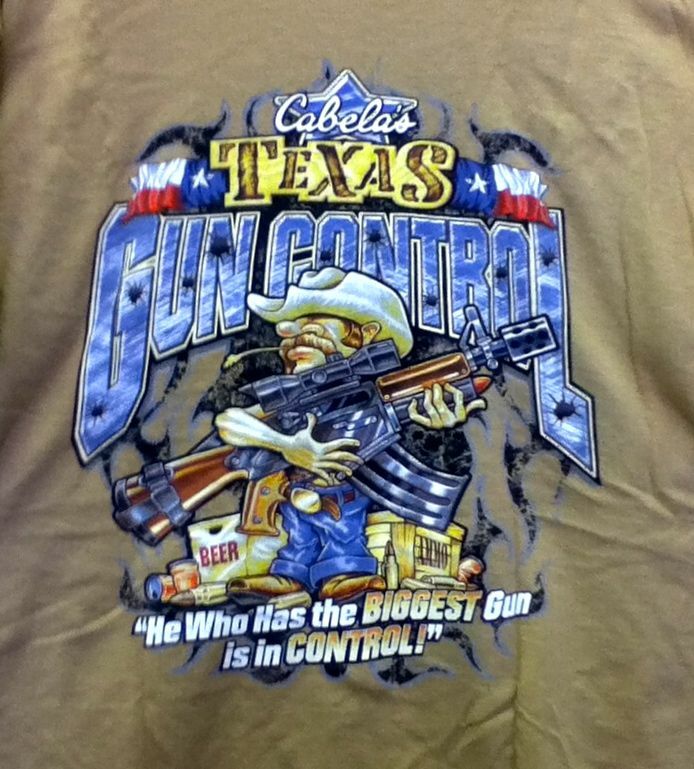 This T-shirt is definitely NOT in the catalogs that Cabela's ships to California. But, after seeing this shirt, I've decided to stop shopping at Cabela's. I'm not sure if I even want to keep my Cabela's Gore-tex suit. It just makes me feel icky. Little Hunting Creek has challenged herself to sew something from silk in February. Since January was my month to buy silk, I might as well join her to sew it up in February. Behold, 6 separate 5 yard pieces from the barrel of silk rolls near the door of SAS Fabrics near Los Angeles. 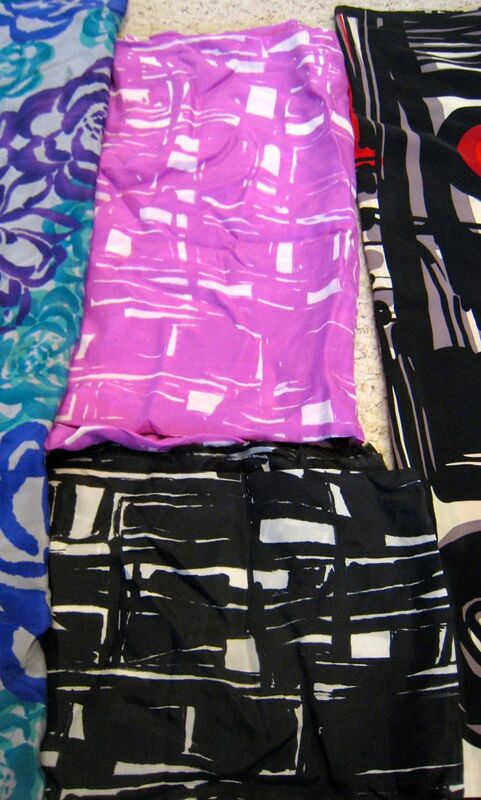 All silks $2.99/yd. That is not a typo. The decimal point is in the correct position. But, seriously. 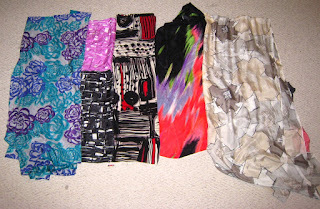 Had it been any other store, I might have spent $90 for 3 yards (a blouse length) * $30/yd. 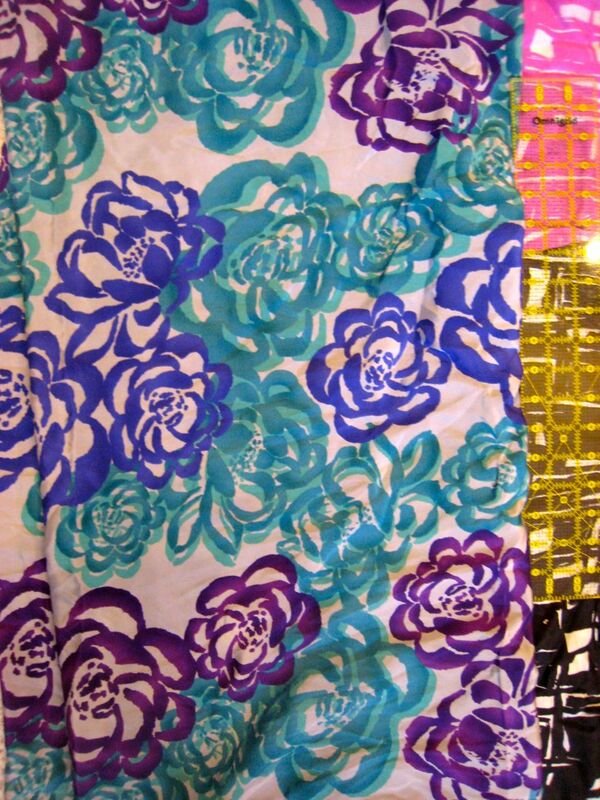 Large-scale roses on a silk crepe de chine in some of my favorite colors. 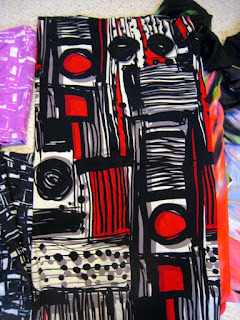 Silk habutai aka "China silk" in pink or black on white. It also comes in teal on white, similar to the teal of print #1 above. 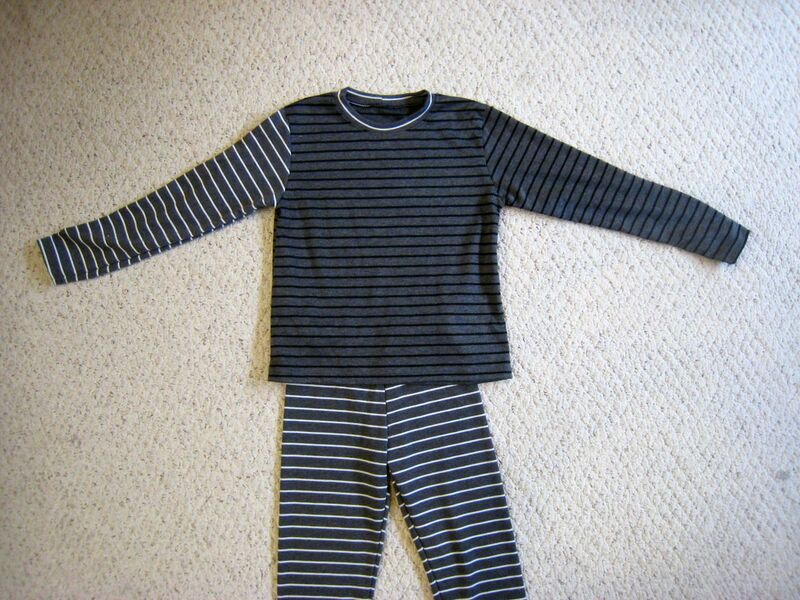 Silk habutai makes an excellent breathable and static and cling-free lining. Prewash before sewing and it's washable, too. 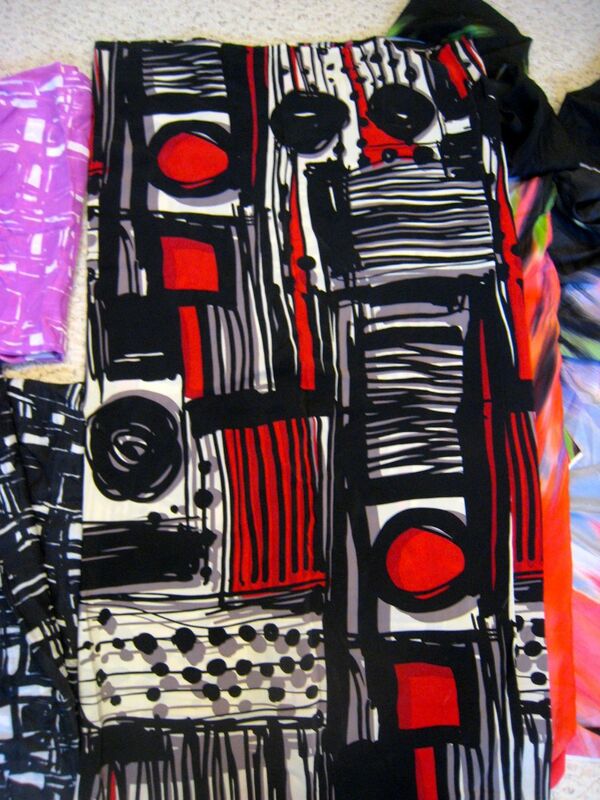 Print #6, another habutai, would make a lovely scarf to accompany this linen blouse I found at a thrift shop. Two of the buttonholes had frayed so I embroidered hand-sewn buttonholes to reinforce them. I've already used some of this piece to line a cotton stretch poplin sundress. The poplin was also purchased at SAS for $5.99/pound. 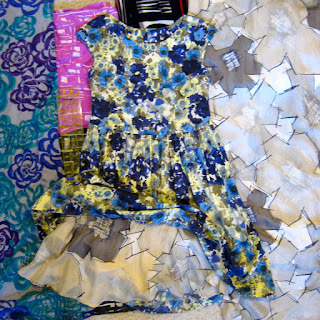 I traced the pattern from Burda Style Magazine, 2011-02-101. You can purchase a pdf of the bodice from the Burda Style website. After sewing a size 40 bodice with a center back invisible zipper, and lining it meticulously in silk, I realized it was too big. I recut a size 38 bodice, self-lined it in stretch poplin, and omitted the zip. Now, only the skirt lining is silk. No one can tell the silk is there from the outside, but it feels lovely on. I even added side seam pockets. 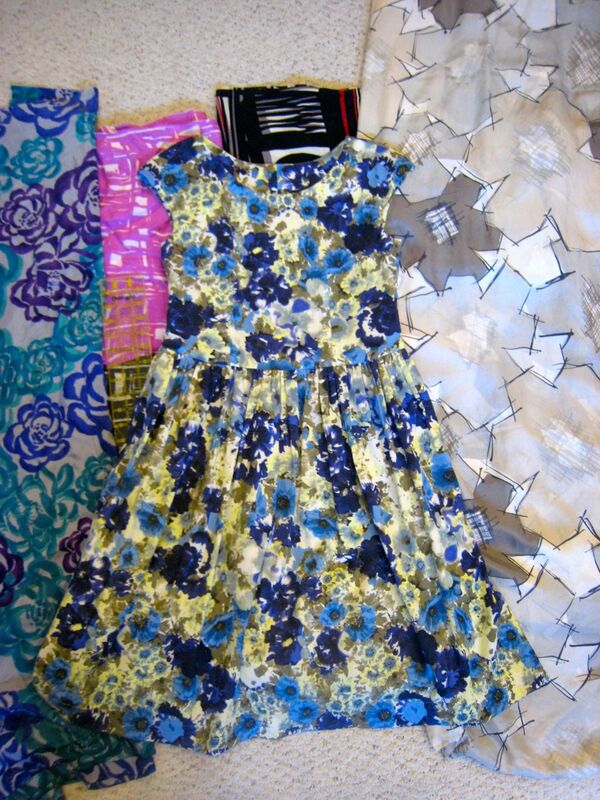 Burda's picture of the dress mislead me into thinking that the bodice is snug. It's actually quite loose and looks better with a belt. I know it's not a blizzard, but we did have some weather excitement today in Los Angeles. We received two short bursts of hail. Iris and her classmates are at Astrocamp this weekend, where they arrived safely, inching their way along mountain roads in a school bus while 8" of snow fell around them. I hope you have a safe and warm weekend. And join us in sewing with silk. You can see the dress on me in Promotion Ceremony Dress. 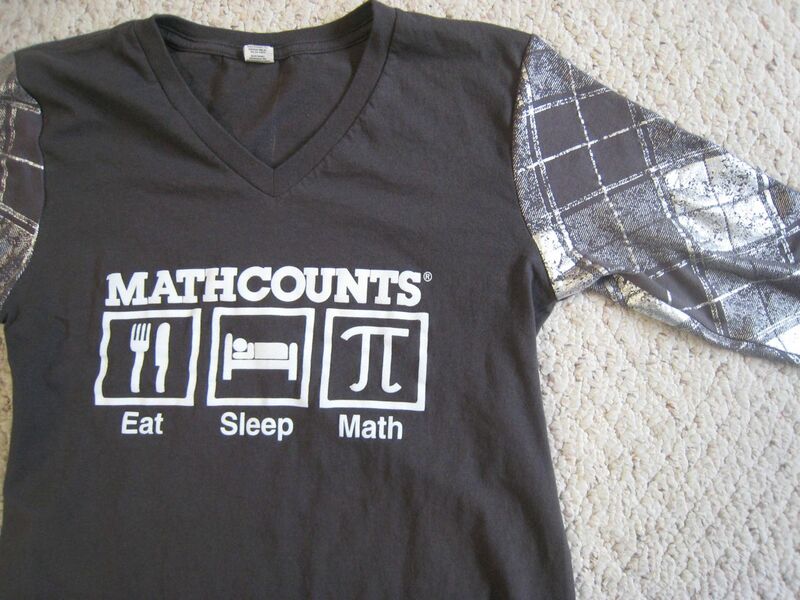 I wear this frequently and receive compliments every time. Best of all, it has useful pockets. FWIW, I throw the dress in the washing machine and line dry it. So far, the silk is none the worse for the wear. 5 years of daily practice, summer camps to train for math competition, really? That's crazy talk from me. When it came to violin, I (begrudgingly) practiced 2 hours per day and improved accordingly. When it came to sports, I willingly practiced 2-5 hours a day. I went to volleyball camp. I went to orchestra camp. 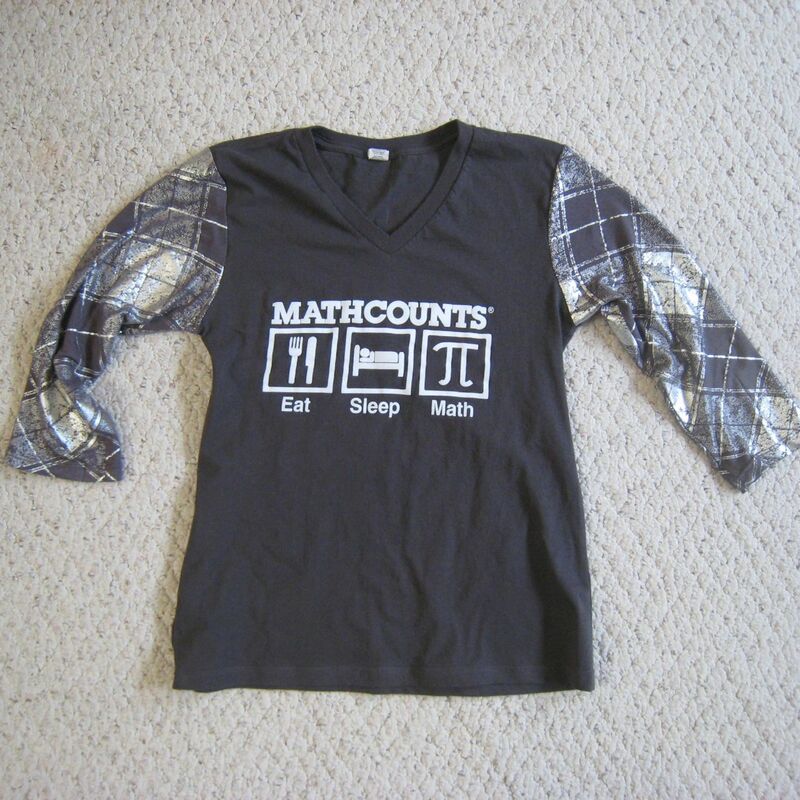 Why did I diss Mathcounts camp? Mea culpa and please call me when you hear crazy talk from me again. This is the only time you will see these two together as she has declared that she wouldn't be caught dead wearing a match-poo set like this. 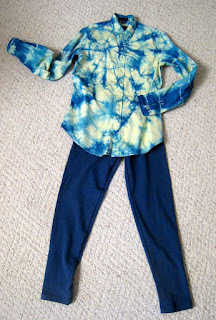 I twisted the shirt up into two counter-rotating swirls and dunked it in soda ash and sapphire blue fiber reactive dye solution. Serendipitously, the resultant greenish blue is a perfect match for the teal leggings (Kwik Sew 3476) I made her earlier this week. I purchased the small piece of teal ponte knit at SAS Fabrics, an odd jobber that sells manufacturers' leftovers by the pound. 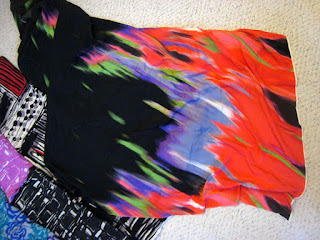 This piece was just large enough to cut out the leggings with almost nothing leftover. This last growth spurt in the middle of winter threw me for a loop. We had to come up with a new wardrobe in weeks. 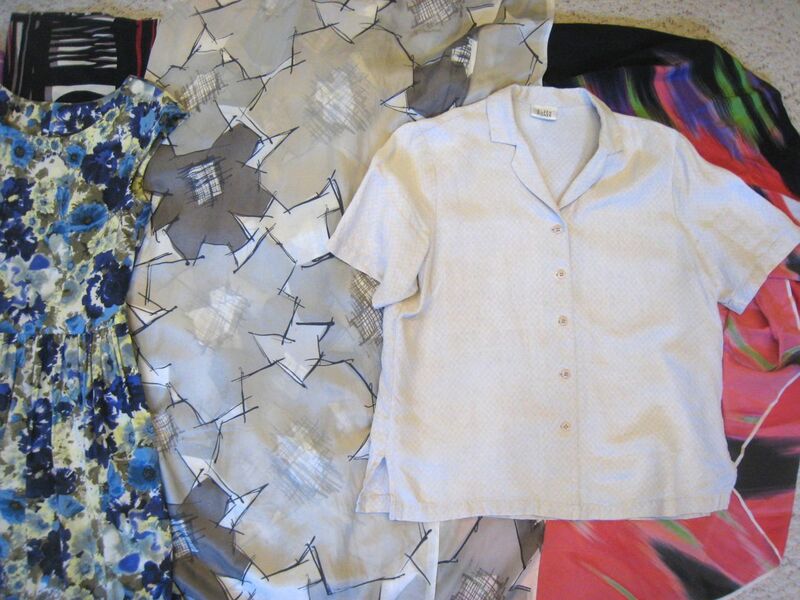 Fortunately, I found 4 blouses she liked at Goodwill, chanced upon a sale at Lands ' End, and was able to make a few quick pieces. She's all set until the next growth spurt and her trip to our sister city in Mexico in April. Her wardrobe is replenished. The ski underwear is done. Her costume for the school play is done. The part of the sets that I am responsible for is done. It's time for selfish sewing. I'm joining Little Hunting Creek for three months of sewing. 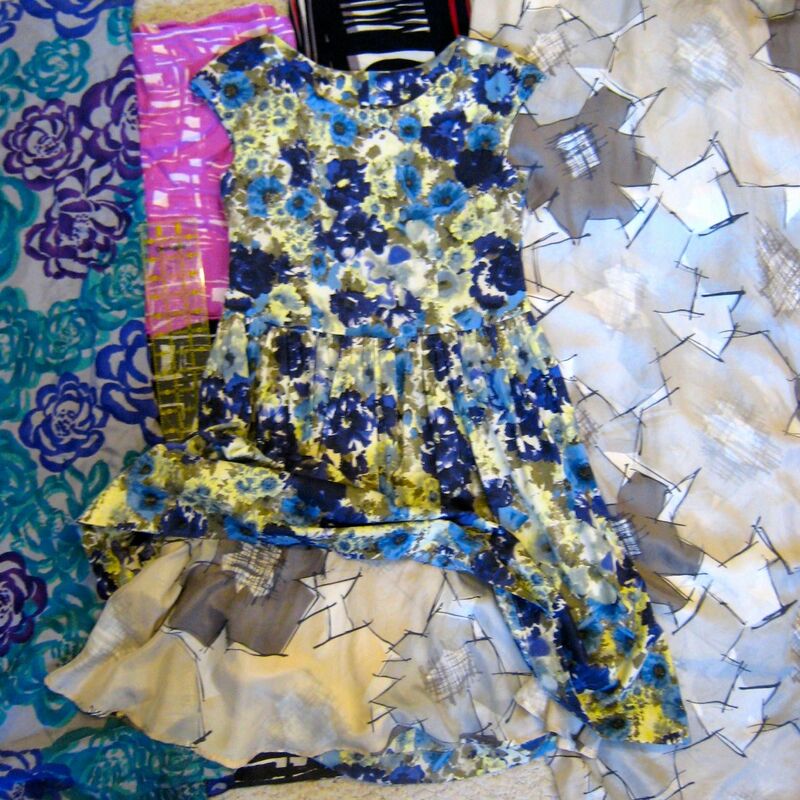 In February, it's time to sew something from silk. Would it be cheating if I sewed something with cotton but lined it in silk? 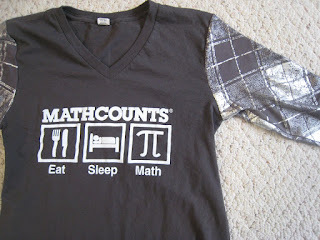 I've changed my thinking about math training. See my retraction. 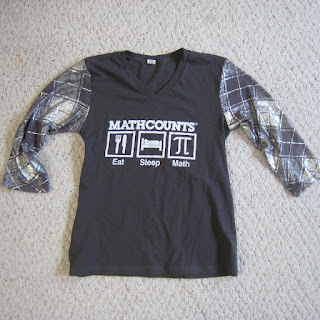 The Mathcounts season is over for Iris' school. Like last year, they placed highly, but not highly enough to advance to the state tournament. They were bested by a highly selective private school and a few teams from wealthy neighborhoods who took a much more serious attitude towards training (5 years of daily practice, summer camps to train for math competition, really?). But, I am proud of how well our kids did in comparison to other teams that took a similar "Let's keep it fun and upbeat" attitude. The kids received two T-shirts for participating and Iris and another teammate won gift cards for ice cream for placing in the top (whatever) percentile. Afterwards, the entire team went out for ice cream to celebrate. Shapeless event T-shirts tend to go unworn and unloved in Iris' closet. I recut the Ts using Kwik Sew 3476, adding waist shaping, trimming the body (from tunic to long T) and sleeve (from full to 3/4) lengths. 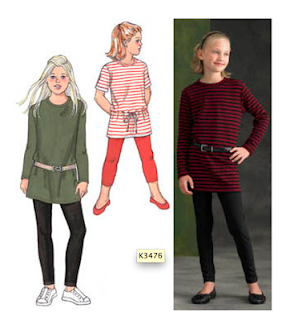 I found some knits with metallic foil at SAS in colors that match. 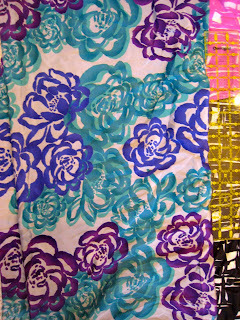 Click the photos to see the fabrics in full metallic glory. After the most recent growth spurt, this 12 year old is wearing a size 14 or Kwik Sew Children's XL. I purchased Kwik Sew 3476 to make performance ski-underwear for our upcoming trip. 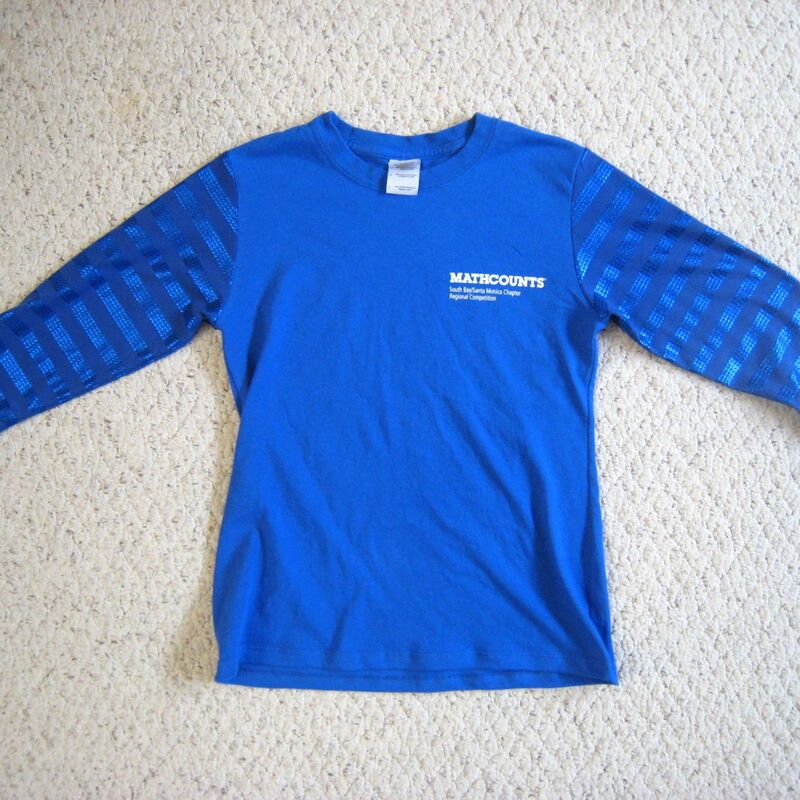 The polyester interlock pieces I found at SAS were perfect for the T-shirt. But, they lacked the lycra 2-way stretch required for the leggings. I'm proud of the stripe-matching. 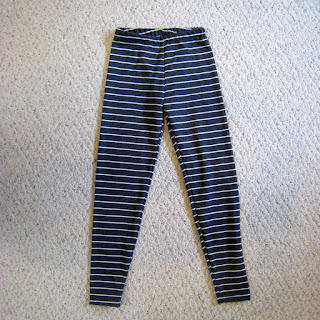 But the leggings are going off to Goodwill. Perhaps a very skinny child will find them useful. Don't worry, I made her 3 more pairs with lycra. You'll see the picture of those shortly.